"Linen leisure wear, available all year round!" "Free delivery & return in NL"
We are proud to carry our family legacy forward by presenting premium linen shirts under our name Wolff & Haslinghuis. Wolff & Haslinghuis provides men with socially-responsible, eco-friendly, and sophisticated linen leisurewear. A shirt with a luxurious, elegant and carefree design. Always pure and uncomplicated, subtle and modest, well-balanced. We believe in slow fashion. We keep our basic shirts stocked all year round to deliver the best service for your cruise or resort items. Also referred to as holiday or travel items! Who are Wolff & Haslinghuis? A heritage family history with inspiring stories. Mr. Jacobus Johannes Wolff born in 1812 & Mrs. Dina Helena Haslinghuis born in 1814. These are my great-great-great grandparents. 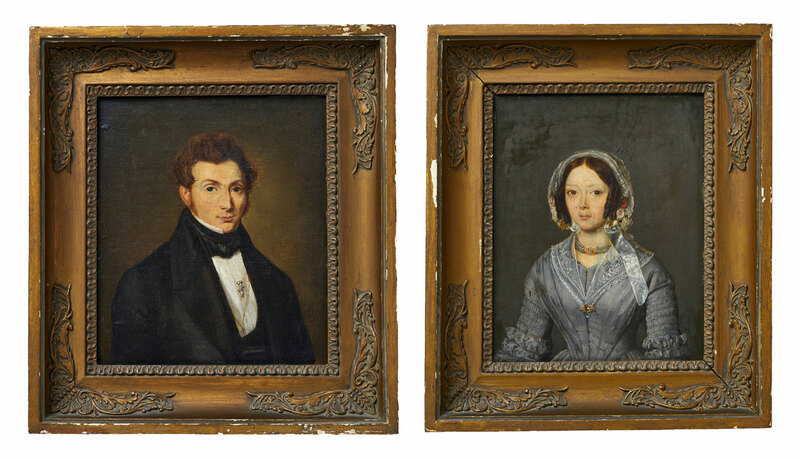 These two portraits of my ancestors, painted around 1845, have been a part of our family history for a long time. The family called them the “little Rembrandts”. I remember them hanging above my grandmother’s antique desk. In the past several years, I have done a lot of research about my family history, and there are some pretty interesting stories to tell! A lot of travelling was done and eventually many of my ancestors settled abroad. Even now, I have family members living in all parts of the world. Our basic “never-out-of-stock” shirts are made of 100% Linen from European flax. A beautiful, natural fabric perfectly imperfect, making each shirt unique. Due to the special garment dye process, and the nature of linen, the slightly irregular colour shades give individual characteristics to this luxury garment. Our shirts also feature a special soft washing for added comfort. Buttons - Our branded buttons are made of the natural material Corozo, which is the nut of a fruit. We have chosen a tone-in-tone colour for our basic shirts providing them with a sophisticated look. We also use eight buttons on the front placket for perfect closure. Details - For our boat lovers or minimalistic-living men: On the backside, under the collar, we have added a small loop to easily hang your shirt in small places. Created for your convenience! French clean seams on the inside - Exclusive Wolff & Haslinghuis embroidery on left sleeve. No Labels – Nobody likes irritating labels scratching their neck. Instead, we made an inside neck print with all necessary information e.g. washing instructions, made in Portugal etc. Again: for your convenience! Fit – Together with our size specialist, we created two ultimate basic styles. Sizes are northern European. A long sleeve classic fit and a long sleeve slim fit, not tight but nicely curved to the body. Our shirt maker is established in a small atelier in Portugal. The owners are brother & sister and have a great deal of experience in textile and pattern making, while creating perfect craftsmanship with care and respect for the employees. Our fabric supplier works only with European flax. Flax = Zero waste! Read all about linen here. Read all about our linen shirts, and all the advantages linen offers! Natural linen: Flax = no waste! Subscribe here for the newsletter!